The first signs of spring, heralded by meadows of wild garlic and brilliant yellow clover at ground level, stir the almond trees (especially around Agrigento) into creating delicate clouds of white blossom into the landscape; next comes the fluffy yellow mimosa and the sweet-smelling, crisp white orange blossom, from which bees produce a particularly fragrant honey. Soon the pinks and reds of the rhododendrons and hibiscus mark the advent of summer; they are joined by the vivid purple, pink and magenta climbing plants and the intensely perfumed jasmine which blinks open its starry flowers all over the main island â especially in Pantelleria and the Aeolian Islands. Throughout the summer, spouting from apparently arid stone walls, there tumbles forth a cascade of roundâleafed caper plants from which the buds are plucked long before the exquisite, pinkish-white flowers can flourish. 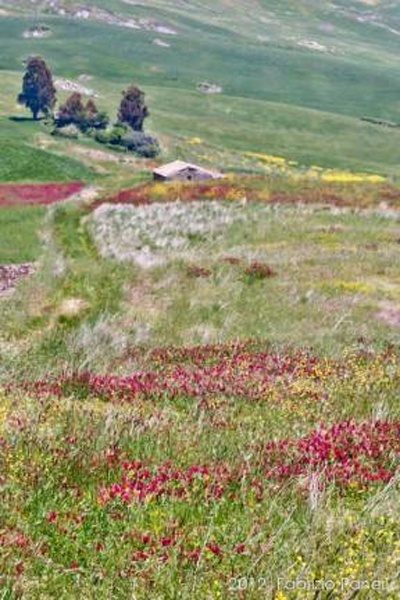 Each region of the island has its local flora, such as the cork plantations near Niscemi (inland from Gela), papyrus plants along the River Ciane (just outside Siracusa) and the cedar tree manna grown in the Castelbuono area of the Madonie.